Chicken Parm is a super simple and really delicious meal. If you’ve already made your sauce, you’re halfway there! Many times I have a ton of sauce left over and I always freeze it. Then I can keep it for long periods of time and not over-sauce my husband. He’s not a huge fan of pasta so I have to figure out ways to switch it up and pace myself because I could totally eat sauce and pasta every day. 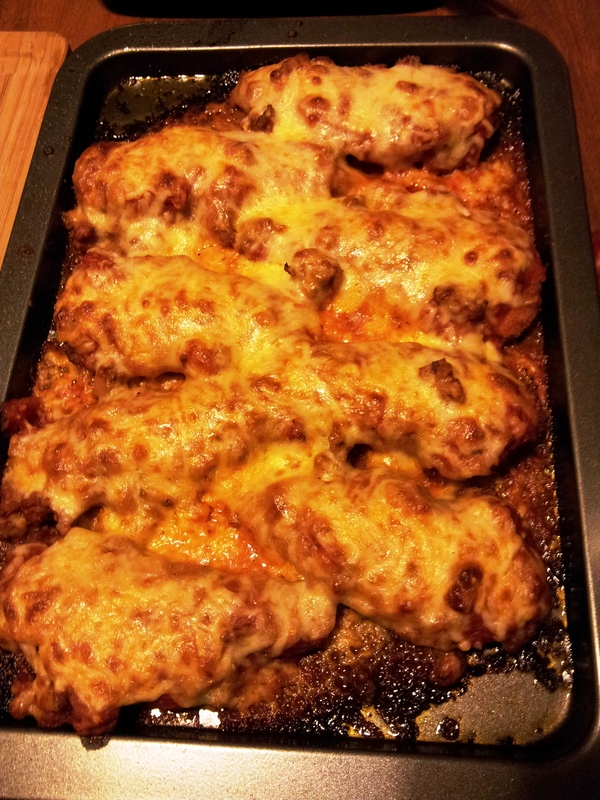 This week, I chose to make chicken parm with my leftover sauce. I have never made it for my husband so I knew he would love it and enjoy not having the same old thing. My best friend was more than willing to join us for this dinner, thankfully she shares my love of food, unlike my husband, so we can bond over calories. She’s great because she always helps me cook and clean and it’s definitely always nice to have some company in the kitchen. 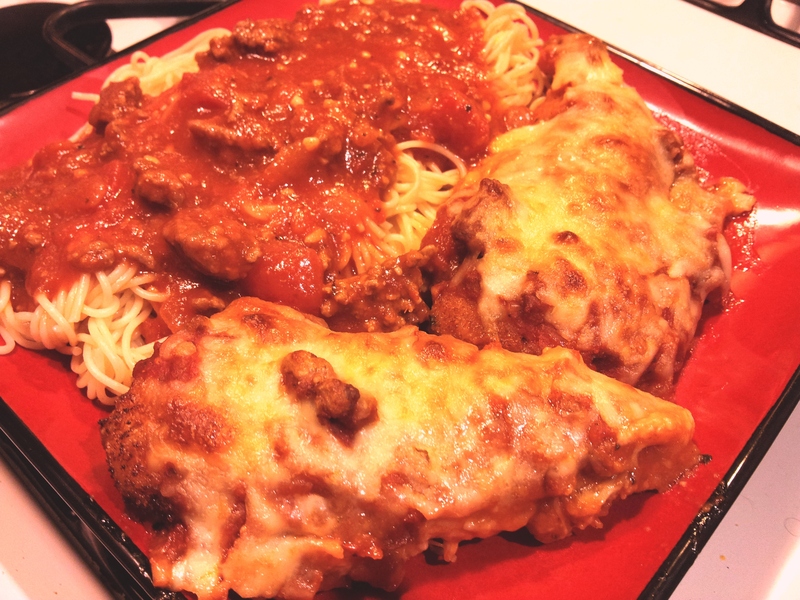 Back to the chicken, I also enjoy having Veal Parmesan, which can be easily switched out in this recipe. There are very few steps and regardless which way you go the end result is fantastic. Good luck! 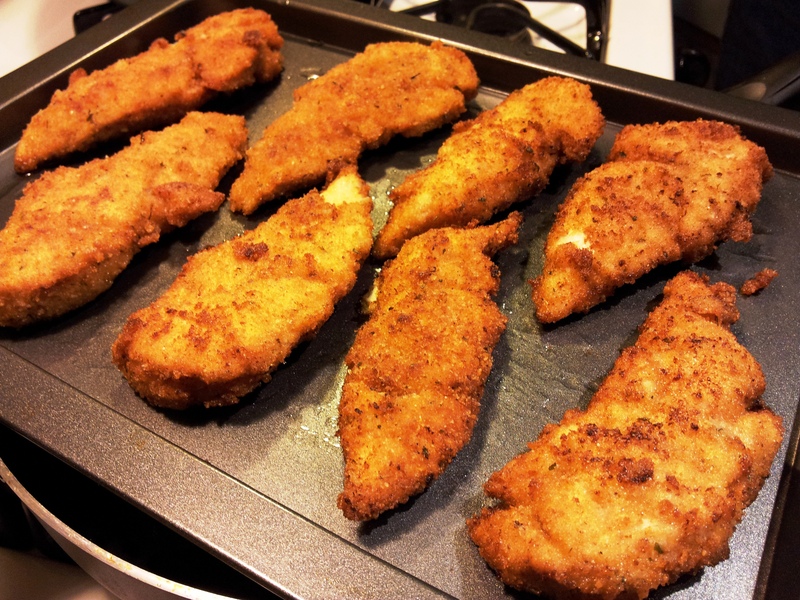 Clean fat from chicken breasts. 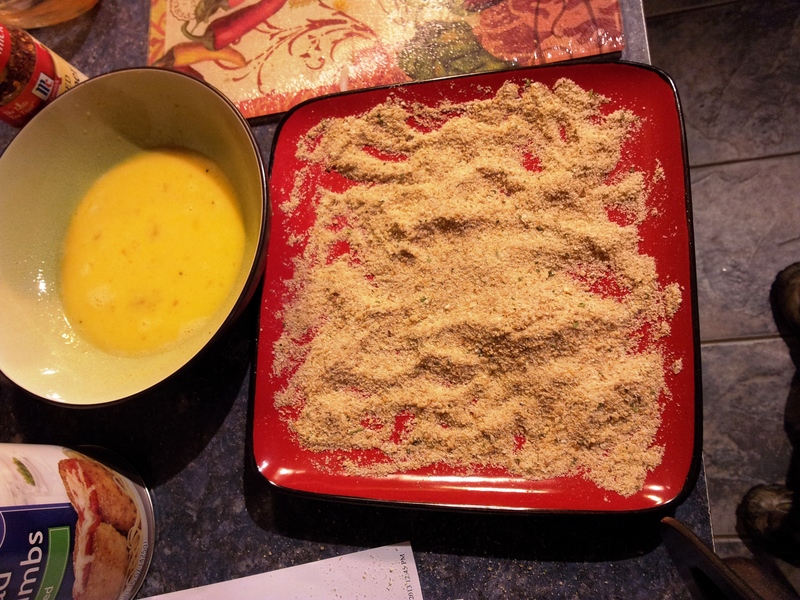 Dip chicken breasts in egg seasoned with salt and pepper and then bread crumbs. Fry in a saute pan in oil until golden and cooked through. 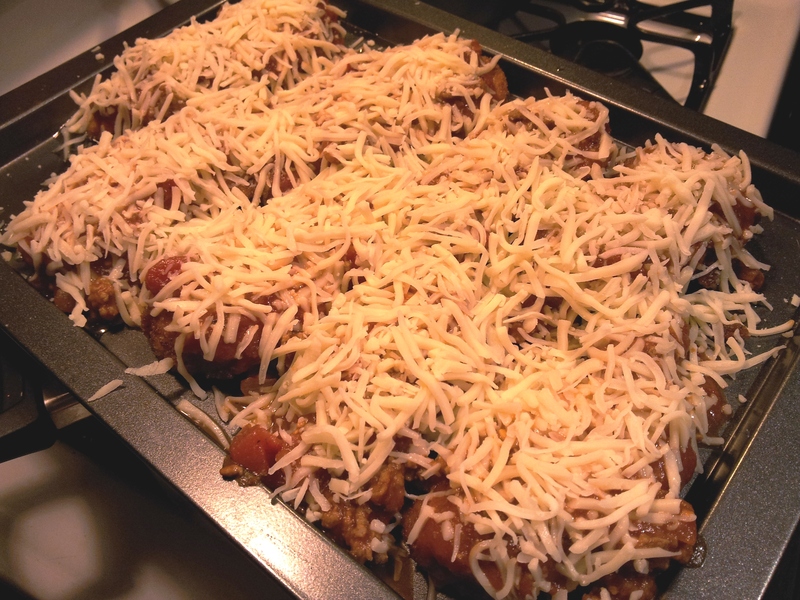 Place in sheet pan and cover with sauce. 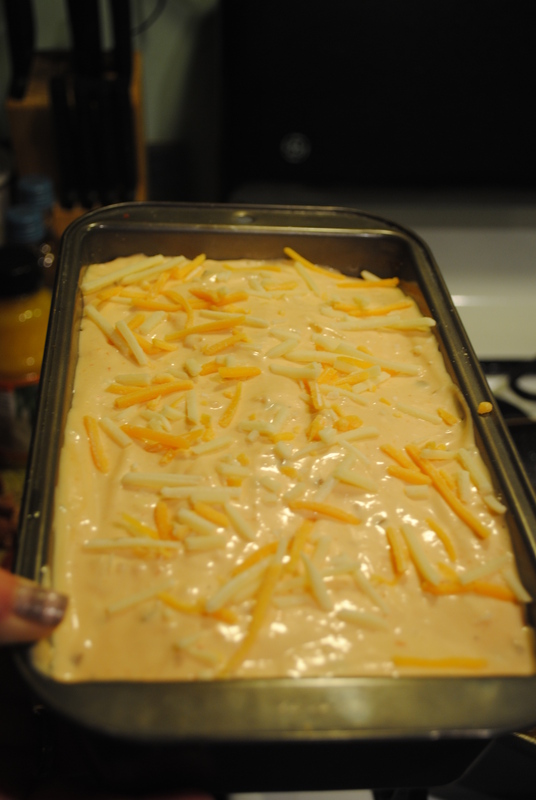 Sprinkle with cheese and bake at 400° until cheese is melted and browned. I served with angel hair on the side. This recipe is simple and delicious. My mom passed it on to me and she got it from her mom and so on. The best part about Lasagna is that you can add whatever you like whether it’s pepperoni, sliced sausage, hamburg, spinach, or anything you want at all. The homemade sauce is the best part, however some people just don’t care to make it themselves. I assure you, it really makes the flavor uniquely better. I’ll be sure to add the recipe for the sauce as soon as possible, it’s really very easy and I always have plenty to freeze for later. 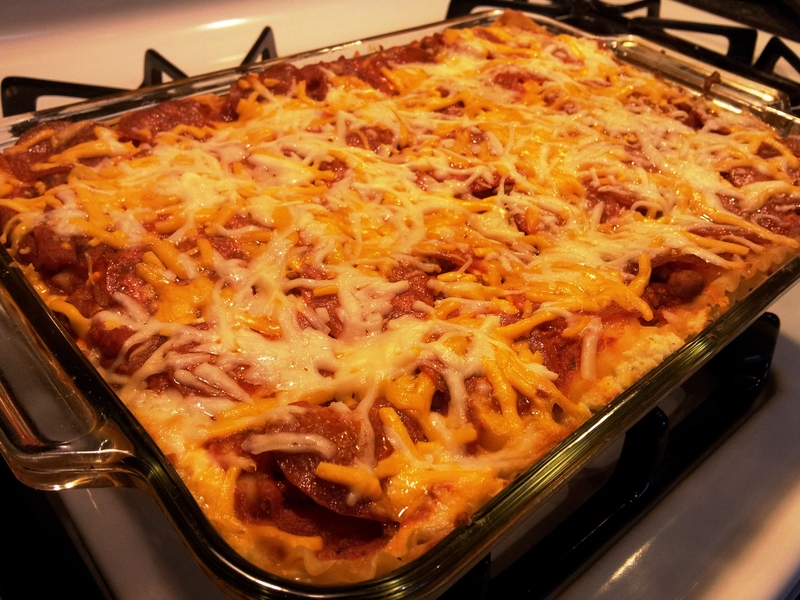 In this particular Lasagna I added sliced sausages in the middle and pepperoni on the top. Sometimes I switch it up and add different things, but this is by far my favorite way! -This is the layer you can add anything under the sun. Once I spread the sauce I layer the sliced sausages, my mom likes to put spinach and sometimes meatbals or other types of meat. It seems difficult to remember, but think about it as a sandwich. Each layer is divided by noodles and the ricotta is like the bread with sauce in the middle. Now that you’ve assembled the layers, you will want to gently cover it with foil and bake at 350° for 30 minutes, then remove foil and continue baking for an additional 15 minutes. I’ve made this before to bring to work and sometimes I will bake it for the 30 minutes and stick it in the fridge over night, then I’ll do the uncovered 15 minutes the next day so it’s hot, but not overcooked. When I do it this way I have to do it for around 20-25 minutes the next day where it’s starting out cold rather than hot from baking the first time. I like to let it sit for a few minutes before cutting so it can set. It makes it a little easier to work with. 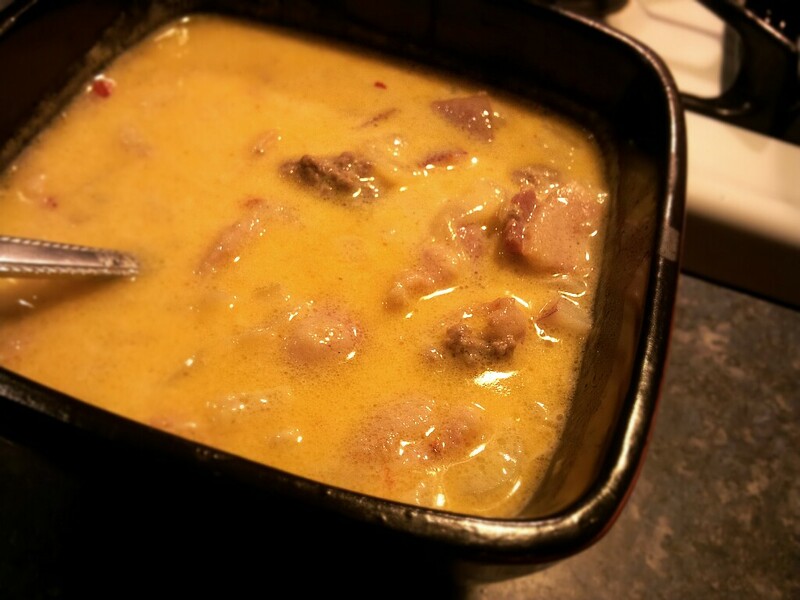 I’ve noticed in the ever popular Cheeseburger Soup recipes that each has some odd ingredients. I don’t recall ever eating a cheeseburger with carrots or celery in it. I am aware of the fact the the potatoes are not in a normal Cheeseburger either, however you do typically have a side of fries…In saying this, I feel that potatoes are not an odd addition to an otherwise delightful bowl of soup. I wouldn’t eat this without potatoes because they definitely make it better. Celery and Carrots, on the other hand, do not sound appetizing to me in this so I removed them and added Bacon. I feel like Bacon is an excellent addition to a cheeseburger. 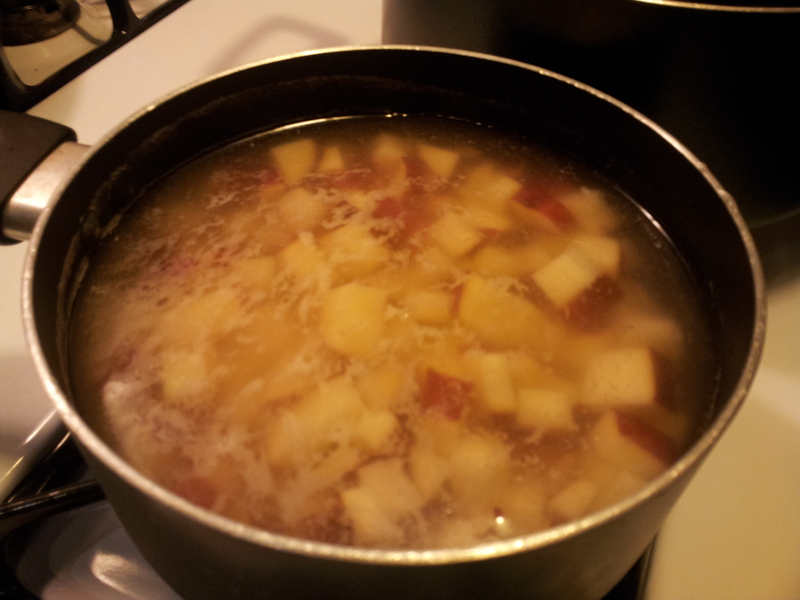 This soup is delicious, at first glance I was a little bit leery of the ingredients, but decided to give it a shot. Since then, I’ve made it four times and I’m delighted to say it’s the best soup, (next to Olive Garden’s Zuppa Tuscana, of course) I have ever had. Chop onions, break up beef, and chop bacon finely. 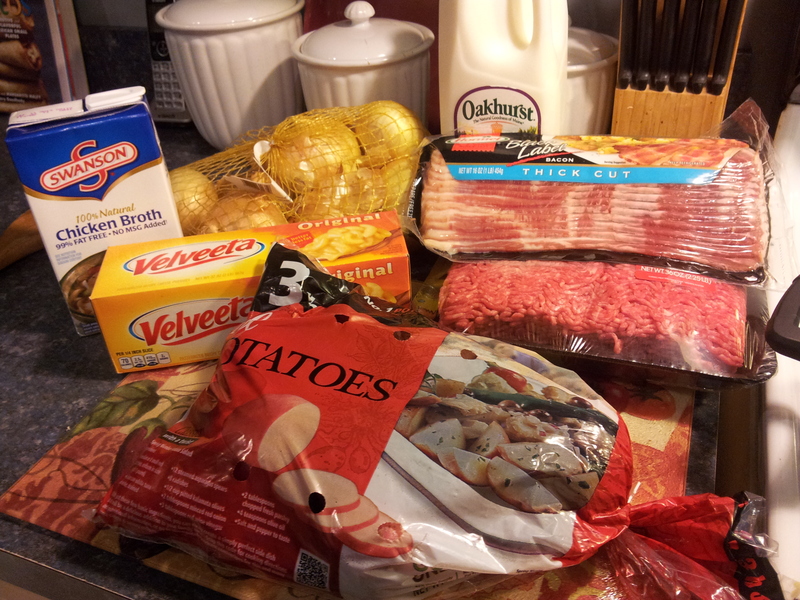 Cook all together in large pan until beef is browned and bacon is crispy. Cube potatoes and boil until soft. Turn crockpot on high for 4 Hours and add cooked beef, onions and bacon. Add chicken broth, spices, and cubed Velveeta. I usually use a whole package, this is entirely up to you as to how cheesy you like it. I usually start out with half of the package and go from there. 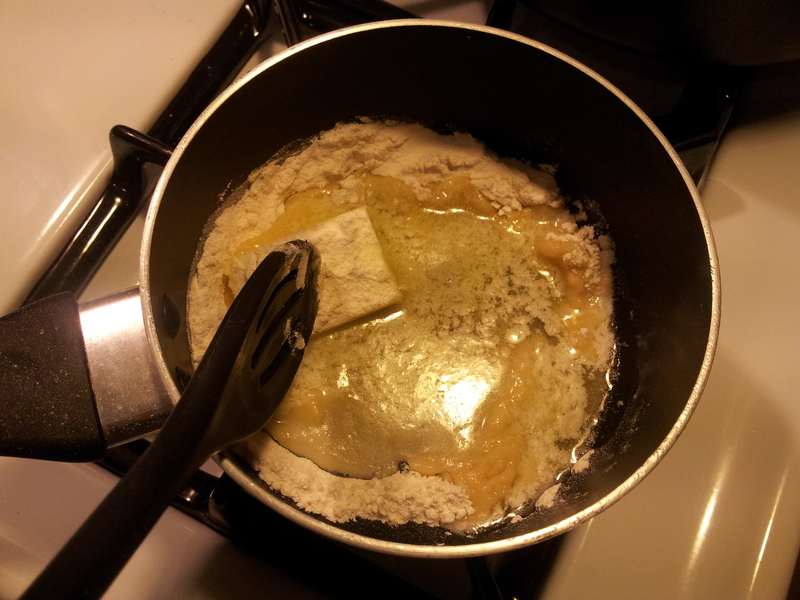 Once the roux is thickened, add to soup and then let soup sit until all cheese is melted. Stir occasionally. I like to serve this soup with some really good bread and garlic butter. I usually get either french baguette or ciabatta bread. Many people add a dollop of sour cream to each bowl. If I have it on hand I do and if not I eat it as is. This is entirely up to you, it’s fantastic either way! Enjoy! 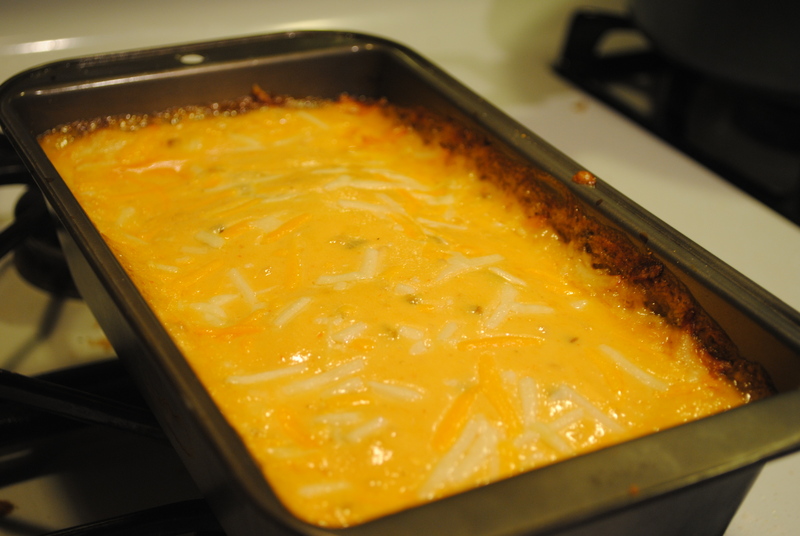 A few weeks ago I decided to try some Rotel. I had never had it or used it before, I had hardly even heard of it. I recently started using the blocks of Velveeta cheese for Macaroni and Cheese instead of Kraft boxes. On the back of the blocks it says Queso Dip and all it is, is half a block of cheese and a can of Rotel heated over the stove. I love anything spicy, Mexican, or just plain cheesy! We decided to try it out and see how we liked the dip. I had bought extra cans of Rotel because I saw that there were a lot of recipes that incorporated it and I thought I might try some of them and having it on hand would be smart. I went on the website and searched for a recipe I had all the ingredients for. I did have to tweak it a little bit, but it was so simple and I had everything right on hand. It came out so unbelievably good! 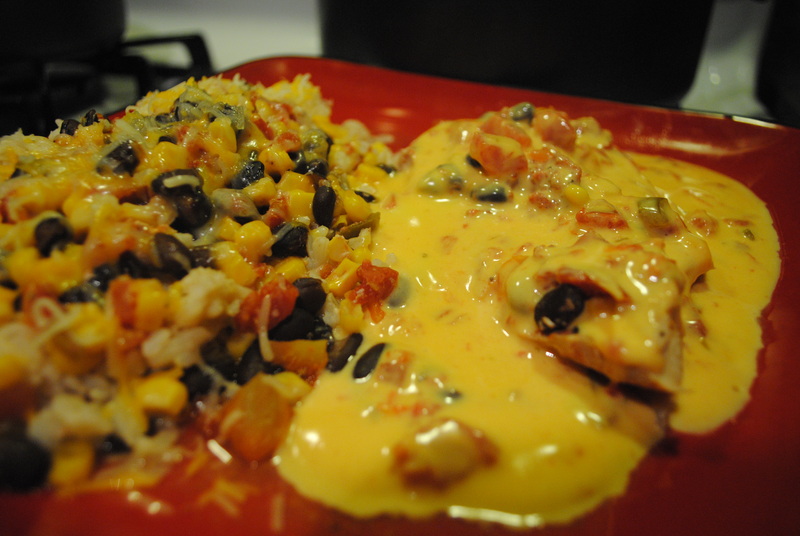 The queso is delicious and we couldn’t pull ourselves away from the stove while it was still heating up! Andrew doesn’t really care for dips and cheesy food but he actually said it was one of the only cheese dips he had ever had that he really liked. We couldn’t stop eating it so when the food came out we put it on top, best decision ever! You can find the original recipe, here. 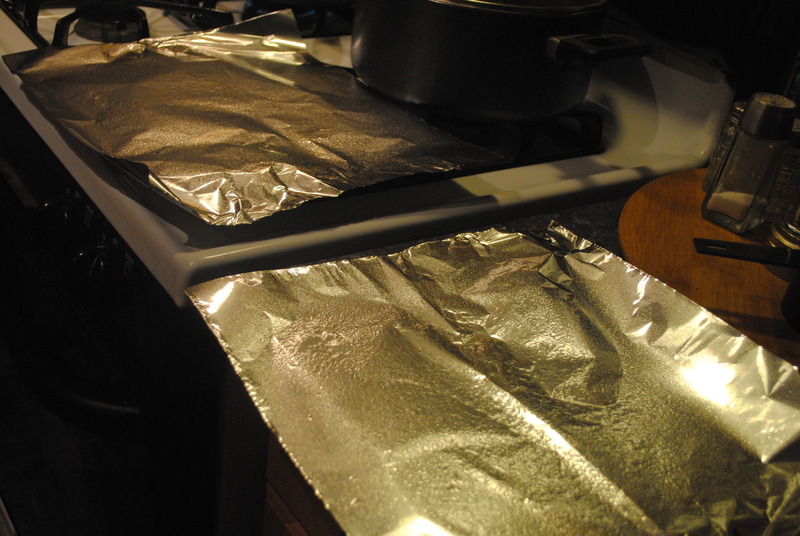 Cut squares of tin foil, 1 for each person. 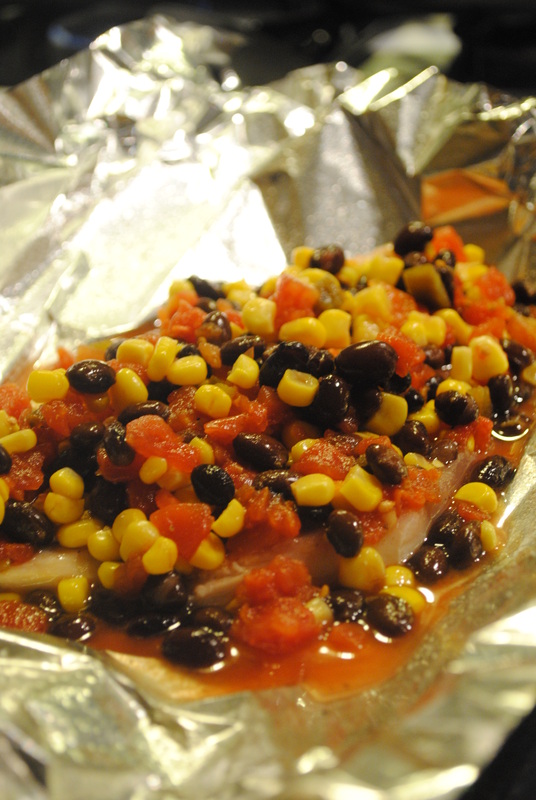 Spray tin foil with cooking spray. 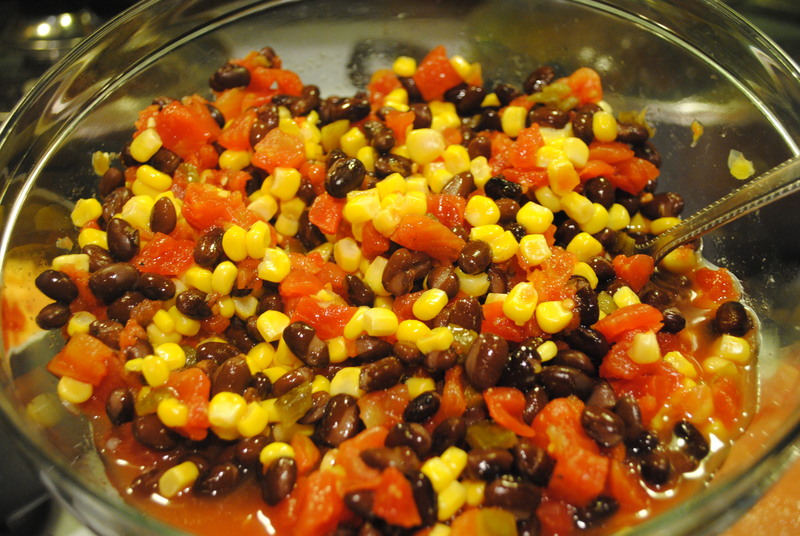 Mix in large bowl corn, beans, cumin, and Rotel. 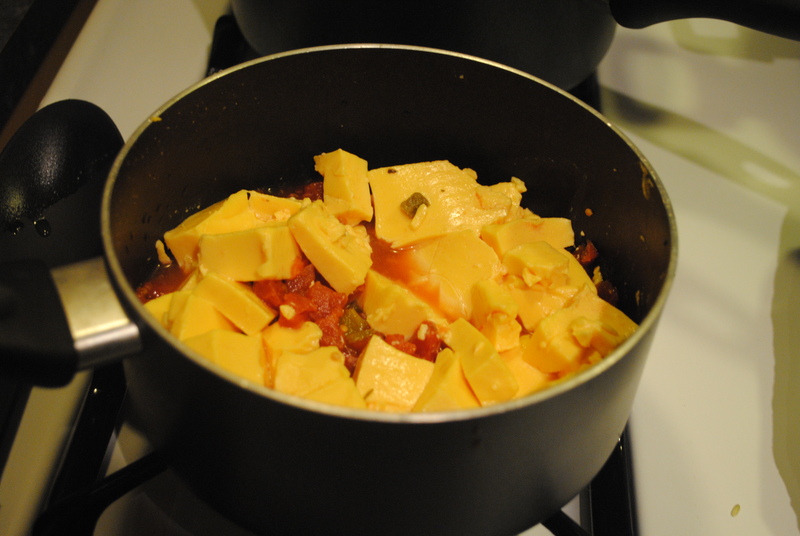 In separate saucepan, mix second can of Rotel and 16 OZ Velveeta cheese and turn heat on low. 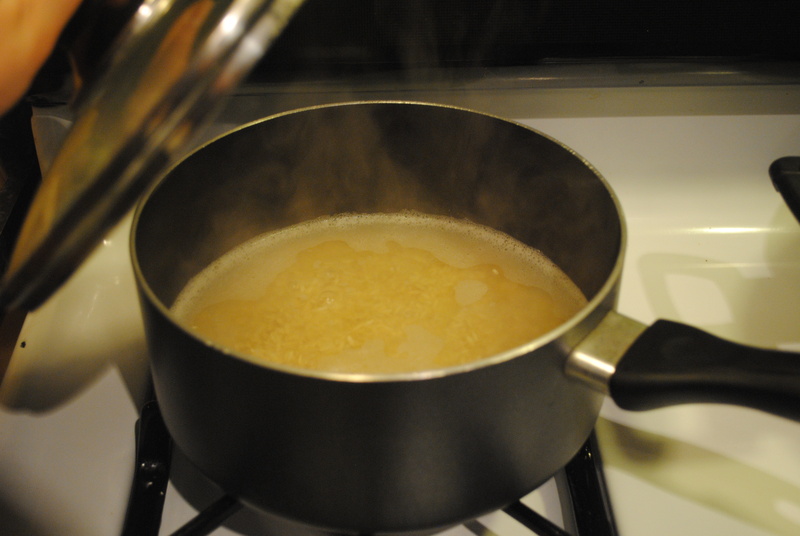 In another saucepan, boil 2 1/2 cups of water and add 1 cup of rice. Simmer with cover on for 45 minutes. 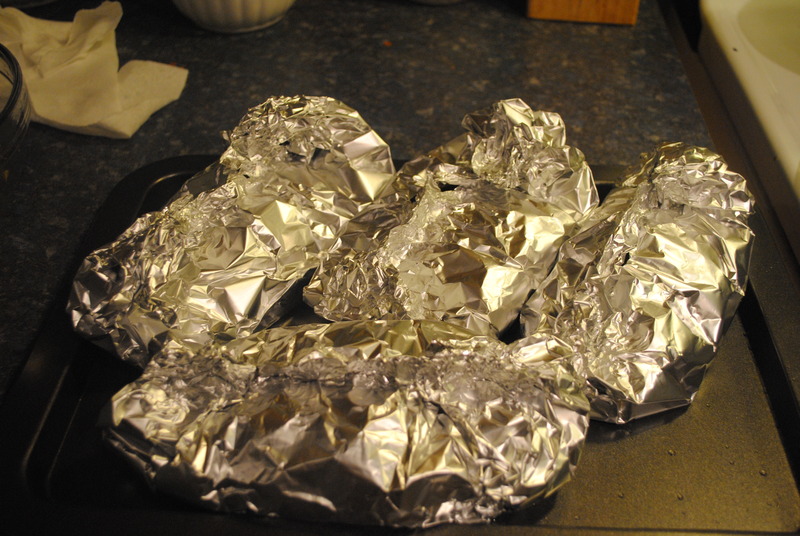 Place 1-2 breasts of chicken on each square of tin foil. 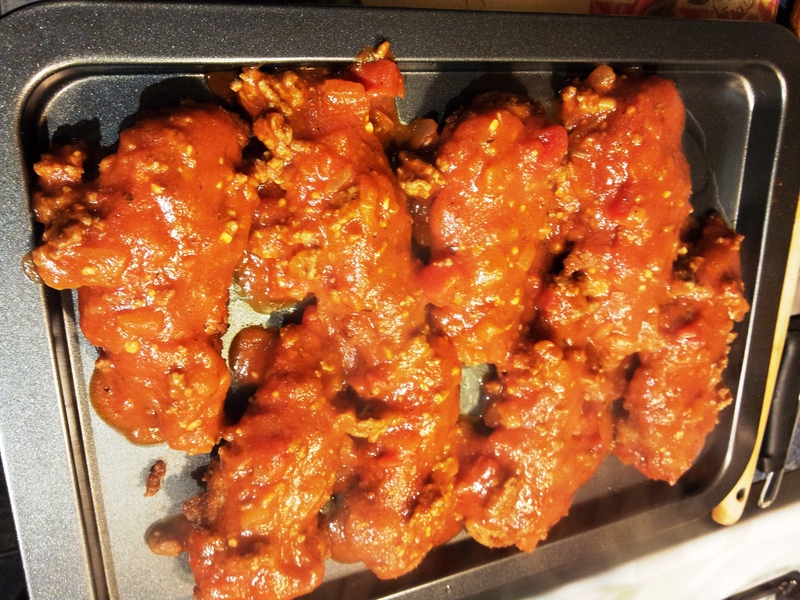 Sprinkle chicken with salt and pepper, and spread bean and corn mixture over each chicken breast until gone. 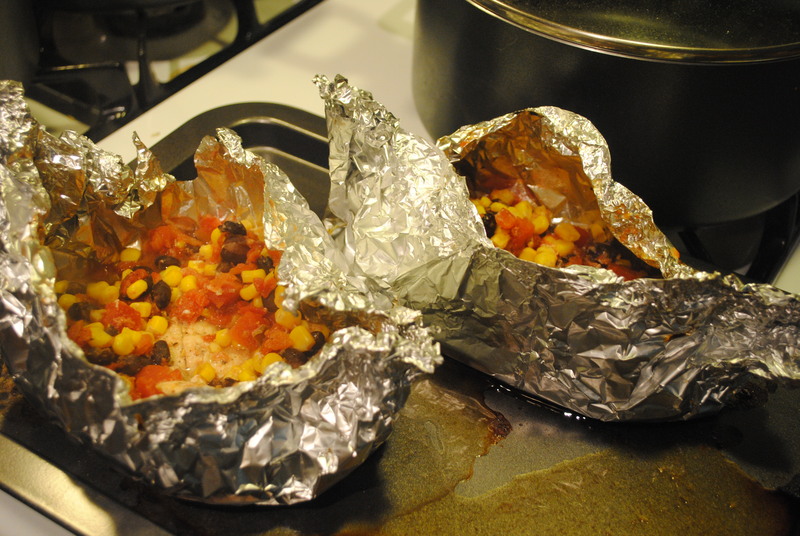 Close tin foil around chicken and bean mixture to form little chicken ‘packets’. When rice has about 20 minutes left to cook, place packets on sheet pan and into oven. Bake 20-25 minutes. When done, wait a few minutes before opening packets and be careful, steam is very hot. Open each packet and check each chicken breast. If not cooked, close back up and put back in oven for 5-10 more minutes. 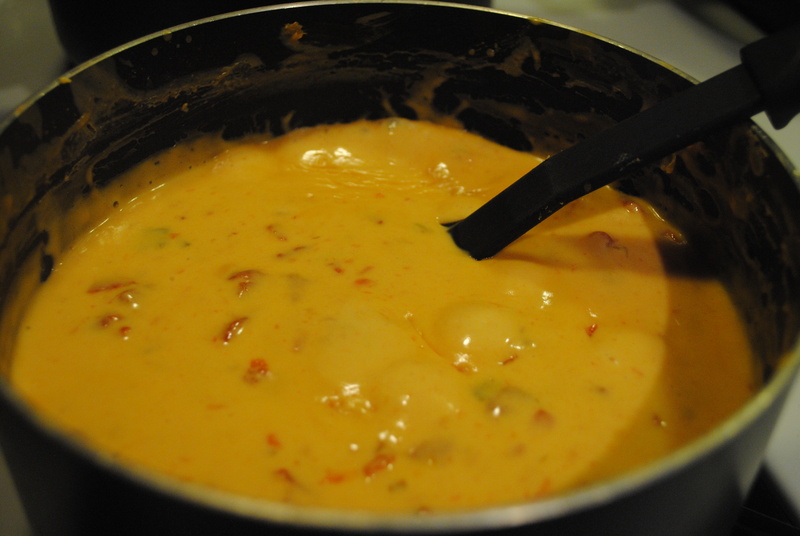 Continue stirring queso and turn up heat to boil gently. 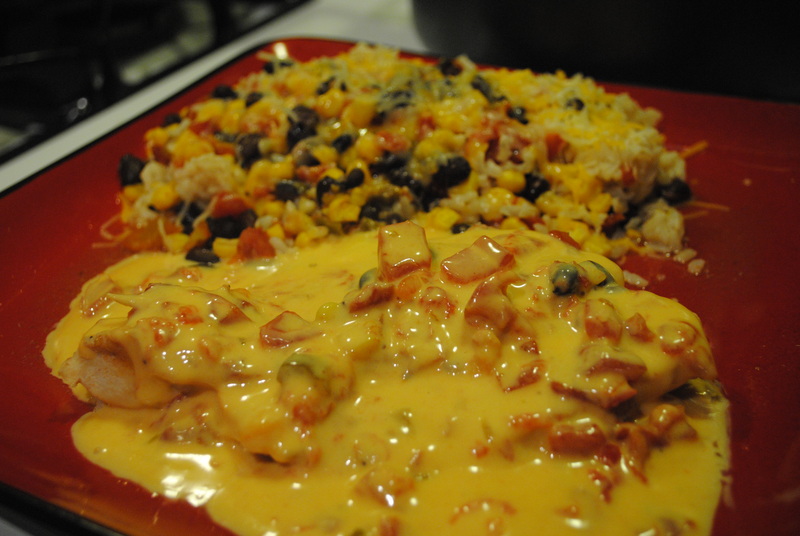 Serve rice, slide contents of packet out over top of rice, pour queso all over beans and rice, and chicken. 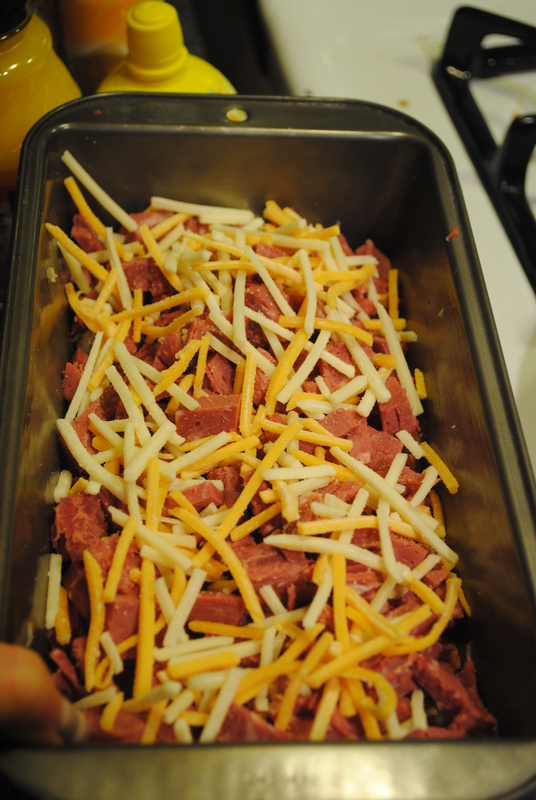 Sprinkle with Shredded cheese. If you’re not used to buying brown rice or white rice, I always buy this kind. I find it right at Wal Mart or Hannaford’s. It’s easy to cook and the directions on the back are very clear and easily understandable. I say these things, because I have a very difficult time with rice. I can never cook it correctly and it always comes out really weird. 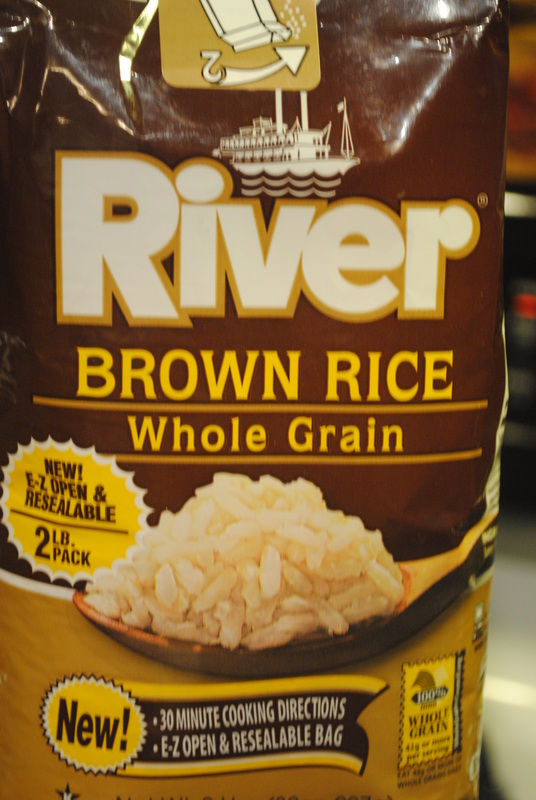 This is the only rice I’ve used that I don’t have issues with. I have a serious soft spot for Reubens. I’m not sure why, because I think sauerkraut is disgusting and I’m not a huge fan of thousand island either, but this dip and Reuben sandwiches are my favorite! I don’t even like Swiss cheese…now that I think about it, it’s quite odd that I like these! When my parents owned the restaurant they would get bored of the same old same old and go through phases of different types of foods. At one point, they were making every kind of egg roll they could think of. They made chocolate chip cookie dough egg rolls, ice cream egg rolls, cheese cake egg rolls, s’more egg rolls, and every other thing they could find to put in them. I loved it when they went through these phases. After the egg rolls, they went through the ‘dip’ phase…YUM. Clearly, one of them stuck. Every thing you could throw into a dip went and it was never disappointing. The Reuben dip was by far the favorite between the employees and we started requesting it on a regular basis, then they added it as a special and it sold like crazy! 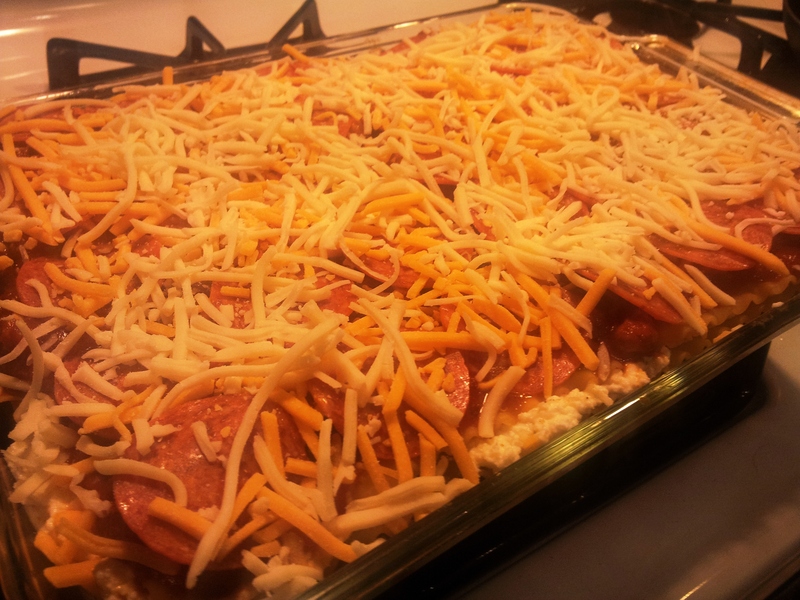 It’s so cheesy and amazingly delicious, I just love it! Now, I kind of decided this on a whim when looking for my Juicy and Delicious Lemon Chicken Piccata recipe, so I didn’t have time to boil the corned beef, so instead, I just bought two large slices of corned beef from the deli and chopped them up very small. 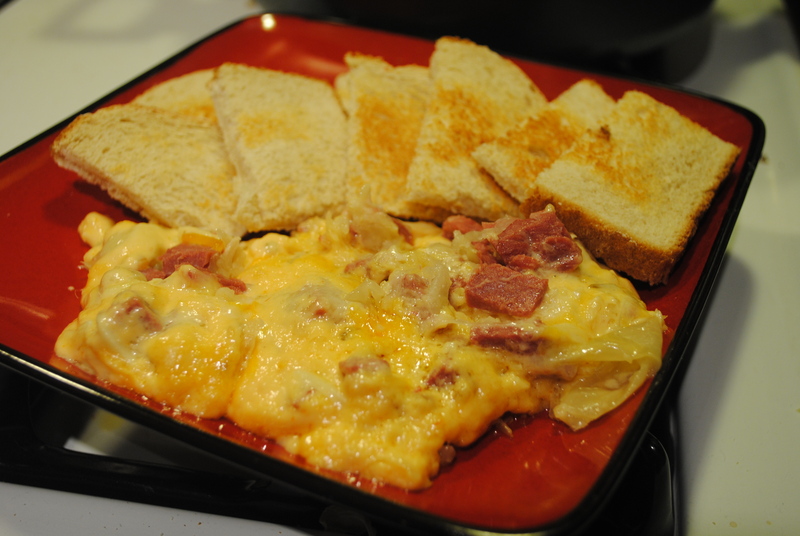 This worked out well, however, the recipe calls for shredded corned beef and I would recommend sticking to that because it mixes in together much easier, whereas this was just chunks throughout. The best part about this? The leftovers made a delicious Reuben sandwich today for lunch! 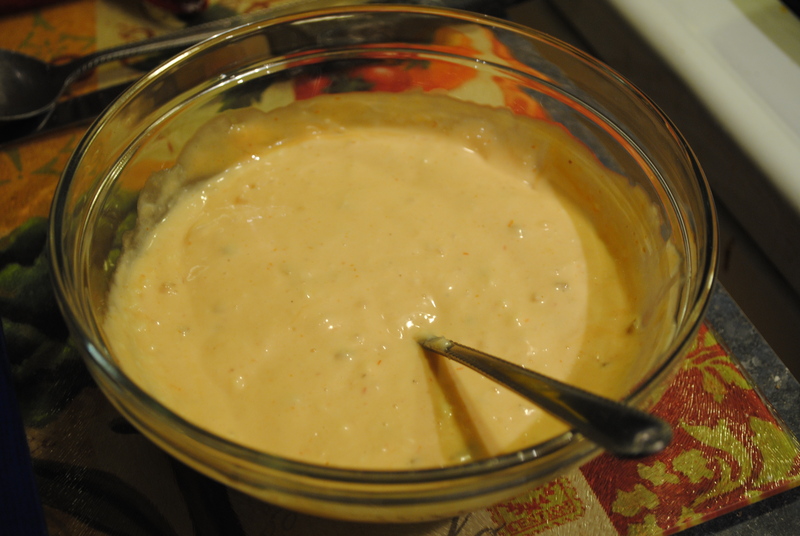 Combine mayo and dressing in small bowl. 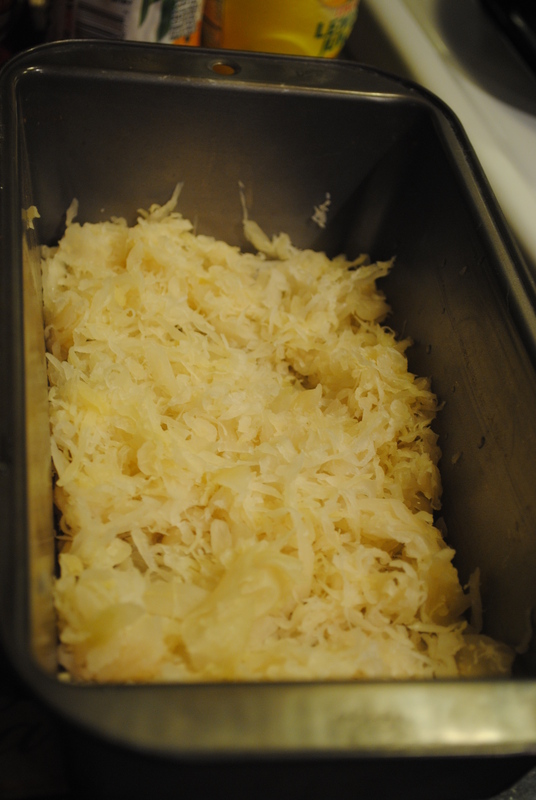 Spread sauerkraut in bottom of baking dish, layer corned beef on top, sprinkle with shredded cheddar, layer with swiss cheese, sprinkle with shredded cheddar, then layer mayo and dressing mixture on top and sprinkle with remaining cheddar. Bake 20-25 minutes, serve with sourdough pieces.